Trophic level: The Tegu Lizard belongs to the third trophic level( in this food chain), since the lizards in overall belong to the third group or the fourth, and because of my research I found out that the Tegu lizard is mainly after the Passion Flower and Helicnius which since Passion is a flower is comes first, and in the Tegu food chain at the fourth place comes the jaguar therefore the Tegu Lizard is placed at third. 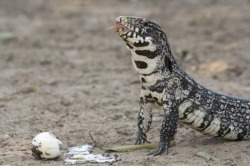 Feeding Habits - Adult Tegu's only eat once or twice a week and juveniles eat daily. In the wild, tegu lizards eat whatever they can catch or find. This includes insects, eggs, birds, rodents, crayfish, fish and oddly enough fruit. The Tegu Lizard is a omnivore animal for he eats other animals and sometimes plants.